I’ve got two young kids, and another on the way. One thing I am always interested in is ways that I can get my kids interested in learning about money just like their Daddy. So when I was offered a chance to review a set of CD’s based just on that topic, I jumped at the chance. The CD set includes one CD full of stories about Sammy the Saver, the main character of the stories and the face of the company. These stories aren’t your typical kids stories. Each story was in depth, and far more detailed than I expected. 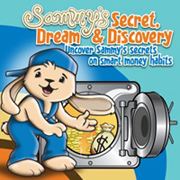 The stories each had a simple problem to be solved that had something to do with money, and Sammy figures out a way to solve the problem by applying advice he learns from his family such as saving a little every day to reach a big goal later, and making things a habit. My favorite thing about the stories are that they aren’t just about money. They include real life lessons that may be overlooked if your kids are a bit younger, but they are there waiting to be found as your kids get older. One of the stories in particular was all about entrepreneurship, and didn’t include your typical lemonade stand (although another story did include lemonade stand) but it had Sammy creating a unique idea for a business and following through with that idea to actually generate a profit. The stories were also interspersed with songs that had something to do with the chapter being read. The songs were short, but gave you a little break to think about what you had just heard in the story. On the second CD, I was actually happy to find all the songs from the stories, but in full length versions. Each song had a theme and lesson for the kids to pick up on. My kids loved the music. The lyrics were catchy and I caught myself singing the songs to myself at work. What I found most impressive about the songs though were that they were so well done. Many of them sounded like something you may find on a Christian rock CD; very uplifting and positive, while others sounded like something you may actually find on a regular radio station. They were catchy, creative and had really talented musicians singing the songs. The genres the songs cover include Gospel, Rap, Rock, Reggae, Pop, Latin, Punk, Dance, Bop, Country and Soul…just about every type of music out there and my3 year old picked up the lyrics pretty quick and loved to sing along. After listening to both CD’s I thought I would do a bit of research about the company and author of the stories. It turns out Sammy Rabbit actually does live appearances! The companies website is full of resources to help teach your kids about money, and other life lessons. There are parts of the website that are obviously written for kids, and then other parts written as tools for adults. The authors back story is pretty interesting too. I really think this company has some great tools and products to teach real lessons to kids about money, on top of the simple “save your money” (for no reason at all) that is common among kids teaching tools. The stories had experiences and examples of why you need to save, and what you should do once you save your money. Teaching kids this early to start writing down ideas, and pursuing them, is invaluable and will really help kids become successful. The only thing I found a little odd is that on the CD with the stories, in-between stories there are interviews with the author. While I found these interesting, and they are done in a kid friendly way, my kids (technically, a little young for the CD set anyway) lost interest and wanted me to skip to the next story. Other than that one small complaint my kids had, I think this company has struck a unique idea, is making a difference in financial education and is worth checking out. Disclosure: While I was given the CD set to review, all opinions and embarrassing moments of me singing kids songs at work in front of my boss are mine. Great review of what sounds like a great product. I don't know why they stuck the interviews in like that-seems counter-intuitive. I could see adding a section or disc for Mom or Pop. Thanks Dean and it really is a cool product. The one they sent me costs $11.99. They sell a couple dozen products including music CD's, Books on CD, physical books and coloring books just to name a few. They sell them in bulk packages as well, for teachers. The target age group for the stories were between five and eight, and I could see the eight year olds enjoying the interviews, but I agree, I think it would have been better to put them on a separate CD or added them at the very end versus between stories. The interviews talked about how the author came up with the stories, and what got him into finance. He speaks to the interviewer in very kid friendly talk, using small words, and repeating things to help them sink in, but again, was kinda weird. Thank you for taking the time to review our materials. I'm glad you found them both largely valuable and enjoyable. We have worked hard to make them both educational and entertaining. Regarding the author interviews, we did this so the tools could be used in classrooms as well as cars. We've toured extensively in schools around the US and have discovered that motivating kids to read and write is a constant battle for educators. We also felt, for those not interested they could just click and move on. We'll pay close attention to the feedback regarding this feature and if it warrants it we will either adjust its placement on the audio CD as you've suggested or remove it entirely. Again, thank you! I love when authors of material I review take the time to come by and give their thoughts and an inside look into the product, so thanks for doing that! I look forward to seeing what new things you guys at It's a Habit come up with in the future. Concerning your placement of the interviews, you mentioned them being used as a teaching tool and I can see the worth of putting them where you did if there is a teacher there working through the material with kids, maybe stopping and pointing out important aspects of the interviews. Thanks for the insight there. Sounds like an awesome product! (and thank GOD it's not a Dave Ramsey one! haha). I'll have to check that out. As the father of an almost four year old, as well as a six week old, I know that I'll have to start getting more into depth soon about money-especially given my profession. I did buy my oldest a piggy bank with four sections (Spend, Save, Donate, Invest), and I always show him why he needs to divide up the money he receives. He's picked that up pretty well. I can't wait until I can get him to fully understand the importance of his savings, as well as things like compound interest and the insurance that we've already bought him. It's going to be good stuff. Great review-I may have to check out the product! Thanks for droppin' by Jon. It's funny, when my first was born, I imagined teaching her all about money and couldn't wait. Now she is growing up way too fast! We also have a piggy bank for her, with different slots and I try to teach her everything I can. It's always good to use childrens books to teach children something. Teach so they want to learn. Most important is making learning fun and putting it in a prospective that the child can comprehend. This sounds like a great product. I may have to check it out for my nephews! My worry with this is how different attitudes towards money, and the morals associated with it differ according to culture and country – I suspect these are very focused on American values…”the american dream”! Very nice post! Its my great oppurtunity to visit your blog. I found it so informative. I’ve bookmarked your site too for future reference. Keep it up. kids Wall Stickers on Is Auto Assure a Scam? kids Wall Stickers on Amazon Prime Review – Is It For You?